The Unborn II (1994) - Sci-fi-central.com.  USA  1994  83m   Directed by: Rick Jacobson.  Starring: Michele Greene, Robin Curtis, Scott Valentine, Darryl Henriques, Carole White, Brittney Powell, Leonard O. Turner, Anneliza Scott, Michael McDonald, Sheila Travis, Ron Melendez, Kat Sawyer, Rodger Halston.  Music by: John R. Graham. A sinister fertility experiment has created a generation of twisted children. A relentless woman has made it her business to destroy these mutant babies before they destroy the world! One mother and her only friend are torn between love an repulsion of this deformed being and are ready to fight for it's survival, but this baby doesn't need love. It's been programmed to survive at any cost. 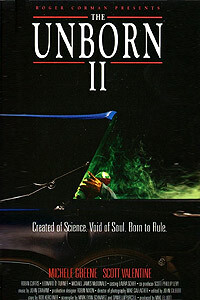 It's amazing that a sequel to The Unborn was ever made, considering how much it borrowed from other more popular, more successful films; although inspirations such as Child's Play and It's Alive did indeed gain multi-film franchises. The absurdity of the first film is doubled for the sequel: the plot is even more ludicrous, the acting is just as hokey, the hideous baby prop got uglier and the slayings are just as laugh-out-loud funny. The Unborn II is pure schlock, but is actually quite entertaining despite numerous flaws - it's a cheesy, obscure B-movie that lives up to the ridiculousness of its predecessor. The opening scene is a shocking child execution at gunpoint as Linda Holt (Robin Curtis) continues on a serial killing spree, crossing off the names of her infant victims. After blowing away a baby point blank at a maternity ward (followed by an unlikely gunfight with security guards, accompanied by the screams of dozens of babies in the same nursery), Linda goes in search of Catherine Moore's child Joey. Catherine (Michele Greene) is a writer who just moved into a new home with her super smart, horrifically deformed six-month-old baby Joey. Little does she know that Linda was also a patient of Dr. Meyerling, a crazed scientist who conducted genetic experiments with the hopes of creating a race of superior humans, and that her child Joey is an extremely intelligent, murderous mutant mastermind who has been brainwashing her into doing its bidding. Nosey neighbors, a careless babysitter, child protective services and more threaten to uncover the secrets of Joey's existence - leading to a bloodbath no one can escape. The Joey doll has gotten even more visually disturbing than the plastic babies used in the first film; it's constantly slimy, covered in blood and emitting guttural cries. Unfortunately it's just as recognizable as an electronic puppet prop. There are a few surprises, however, even if the story is full of holes. Friendly neighbor John (Scott Valentine) presents the biggest mystery, although Catherine's survival skills are also highly questionable. Through the course of the film she falls through a ceiling, down a staircase twice, and battles the cunning baby - all while nursing a bullet wound and neck and leg injuries - and continues to get up, barely flinching, and certainly unable to waste a moment to dust herself off. Perhaps even more comical is the close-quarters shootout in Catherine's kitchen in which dozens of bullets are discharged and no one is hit. The camera frequently spins around and quickly cuts to front angles and back shots of the characters, allowing for Joey to keep jumping out at opportune moments. The scares are rarely sincere, although suspense is hinted at a handful of times. Many segments make absolutely no sense, accommodating for struggling moments of terror - Catherine is left to clean up a bloody murder scene in her own home while waiting for Joey to reappear, and child protective services agents cautiously enter her home as if they were a bomb squad looking for explosives - surely they didn't know the child was a superhuman killer when they were called in. Sadly The Unborn II is set up for a third part when Linda's hit list includes one more name below Catherine's - unfortunate because a third film was never made. It may sound like a complete waste of time, but there is, surprisingly, a high level of trashy fun in this wholly goofy series. Review by GoneWithTheTwins from the Internet Movie Database.